We are a practice of cosmetic dentists in Romford and Brentwood Essex. With a full range of treatments to enhance the smile, Winning Smiles were one of the first truly cosmetic dental clinics in the area. Smile design is a cosmetic philosophy encompassing a ‘Whole Smile’ approach to improving your appearance. Originally developed in the States, the Cosmetic Dentist works in partnership with the Patient and the Master-Ceramist. Our recent innovative treatments, such as Immediate Veneers, combine the latest materials with the best techniques studied from the best, all over the world. There are many ways to straighten the teeth, from simple front teeth custom veneers to white or traditional coloured braces or completely invisible aligners. Porcelain is the closest material to the natural tooth. It has that wonderful ability to allow light to shine through, for the very best in appearance and longevity. The invisible aligner system is clearly a winning combination of effective teeth straightening with discretion and comfort, the ability to remove them when needed. Teeth whitening (aka teeth bleaching) is something that you might expect from one of the more established cosmetic dental clinics in Romford. Our Cosmetic Dentists have seen over the years is that dental bleaching/whitening does not work on teeth that have very heavy stains covering the enamel surface pores. This chap said he had been hiding his smile for years. His main issue was the general yellowness of his teeth and an old filling in the upper central incisor..
And so with that in mind, we are happy to offer free consultations, as this is a big decision for most people. We are careful to take budget, comfort and appearance into account when explaining all the available choices. There is never any pressure to proceed, and certainly not on the day. We feel lucky to help people smile without thinking, hope to see you soon. Click through for the beautiful before and after images.. 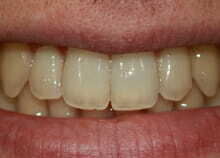 Immediate veneers are particularly suitable for worn down teeth, some great example photos here. The composite material we use has been developed to emulate the beauty of natural teeth in prime condition. 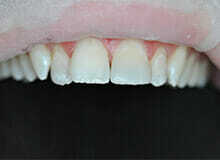 We are now achieving some amazing results with immediate veneers. 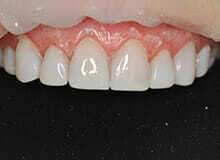 This is a great treatment for spacing and misshaped/crooked teeth using our Class IV composite Vannini technique. The original teeth are left completely unharmed. Invisalign Lite is available for patients with minor crowding and spacing, specifically designed to provide affordable, predictable treatment for simple cases without compromising on quality or treatment outcome. This was one of the more complex Invisalign cases, and it demonstrates that the system can handle some quite significant movement of teeth when required. 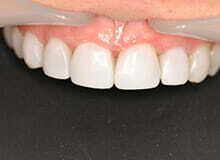 Plus of course, the patient enjoyed the usual convenience and discretion during treatment that Invisalign gives us.